Oftentimes, when an idea pops into my head, I question its originality. People say there’s no such things as an original idea anymore… right? After finishing this project, I have seen so many references to the moon phases in others’ craft projects and art pieces. Original… maybe. But the truth is, we all influence each other. I assure you, my hiatus from blogging was unintentional. I’ll keep my excuse short: I started a new job, and it took up a lot of time and energy. But I am officially on Christmas vacation, and work does not start back until Jan. 4. So let the blogging begin again! 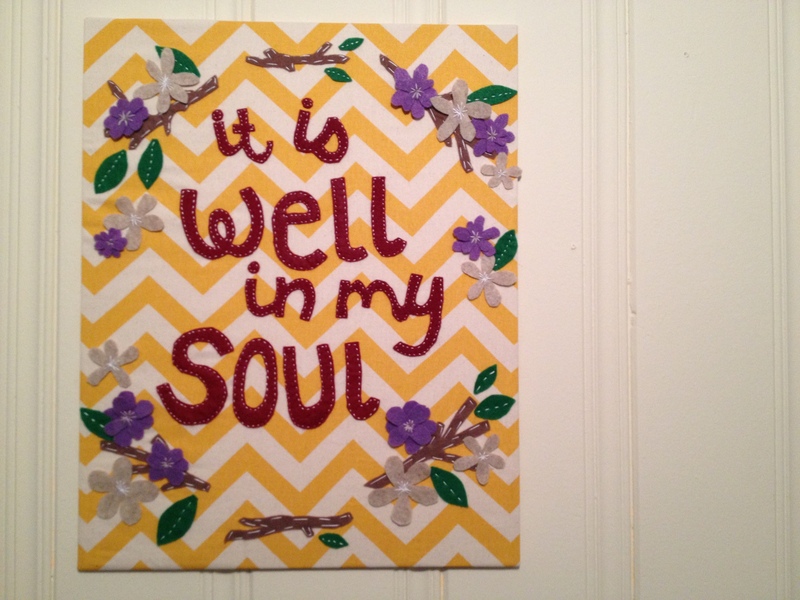 To kick things back off, here is a project that I made with my friend Katelyn for her wedding this September. 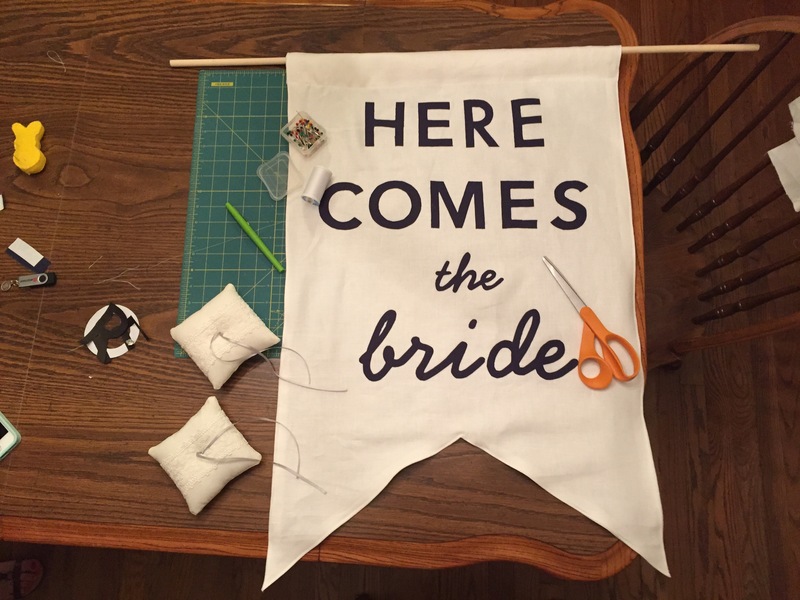 Together, we made this beautiful banner and two pillows for a “ring passing” ceremony. Way back in June, Katelyn came over and we made this banner together. We used a linen fabric for the banner and a black cotton fabric for the letters. Katelyn found two fonts that she liked, and we used Heat ‘n Bond to cut out and adhere the letters with an iron to the banner. We decided to not sewing over the letters – though it would have secured the letters in place. We figured if a letter fell off between then and the wedding, Katelyn could cut out another letter and iron it on. Luckily, everything stayed in place, and the banner looked stunning on the day of the wedding. I especially loved how during the reception, the banner decorated the gift table. 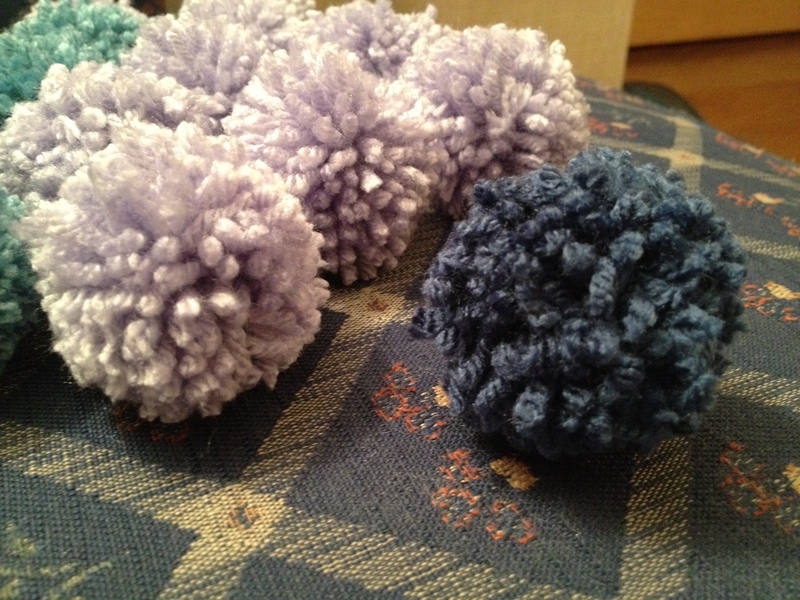 We also made two little pillows for a “ring passing” ceremony. The pillows were very simple, but by using lace, I feel like they really became something special. We also attached little satin ribbons that they used to tie down the rings. 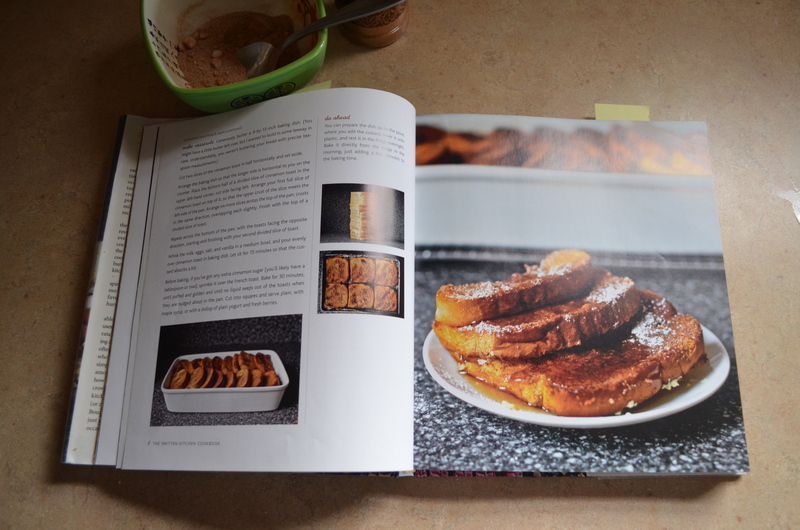 Last week, I came home from the library with The Smitten Kitchen Cookbook, a book that came highly recommended by a friend. These days, my day job keeps me well stocked in cookbooks, so when it comes to purchasing one myself, I like to test it out first. Based on a blog, this cookbook is wonderfully visual, and it lays flat (which I love in a cookbook). 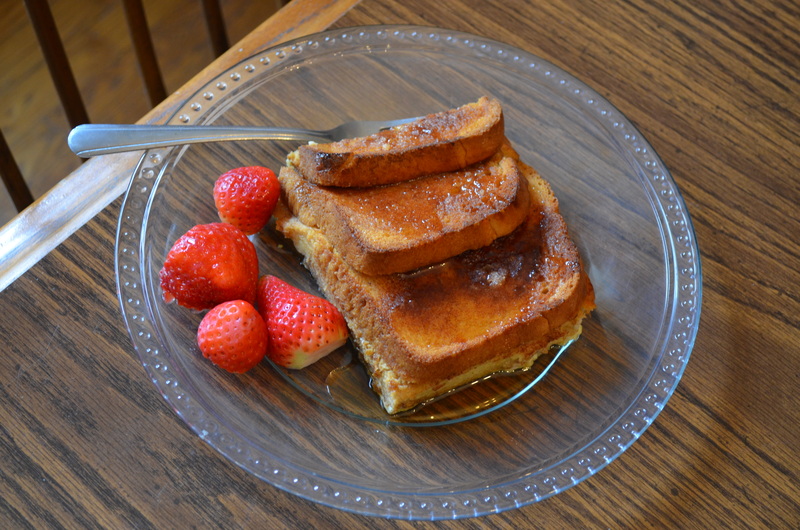 My first recipe to try was its Cinnamon Toast French Toast, and to put it simply, it was a winner! My no. 2 reason for loving this reason (no. 1 being how delicious it turned out) is the fact that I can make most of it ahead of time. The night before I made the cinnamon toast. Preheat the oven to 450 degrees. 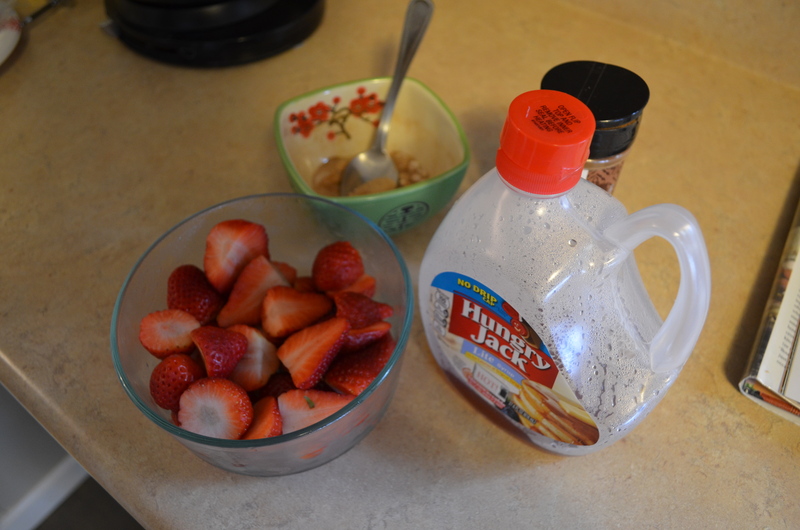 Combine the cinnamon and sugar in a small bowl. Place the slices of bread in a single layer on 2 parchment paper-lined baking sheets. 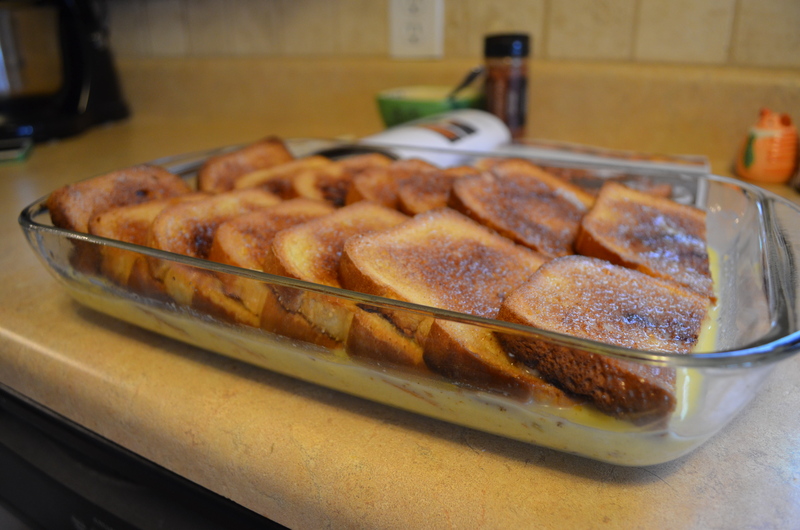 Spread butter on the top of each slice of bread, and sprinkle with a spoonful of cinnamon-sugar mixture. Toast the trays of bread, about 7 to 10 minutes. Remove for oven, and let cool. Generously butter a 9- x 13-inch backing dish. Arrange the bread in the pan. Cover with plastic wrap and store in the refrigerator overnight. The next morning, I let the pan come up to room temperature as I whisked together the milk, eggs, salt and vanilla in a medium bowl. 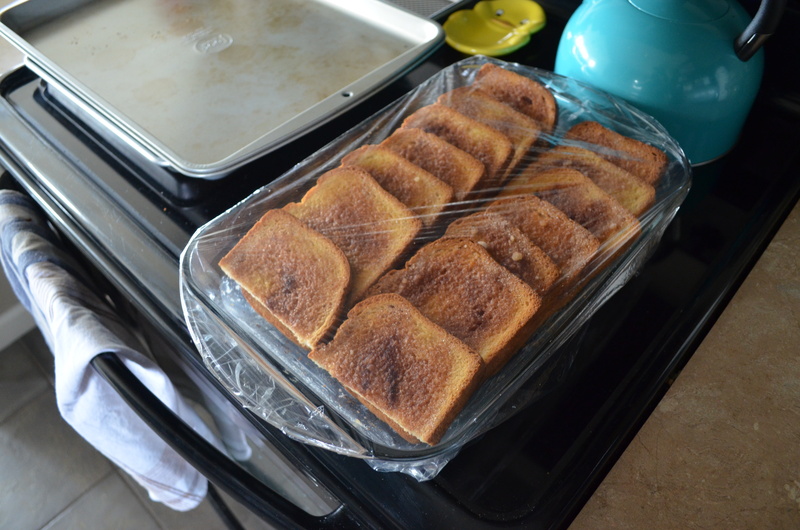 I then poured it evenly over the cinnamon toast and let it sit for 15 minutes (to give the bread time to absorb the custard). 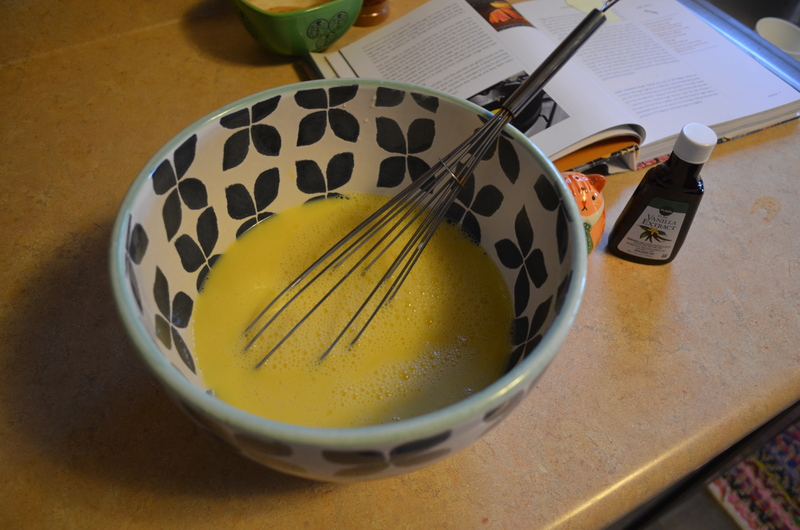 Next, bake for 30 minutes, until golden and egg mixture looks firm. Cut into squares and serve. The same weekend, I tried a recipe for Brownie Roll-Out Cookies that turned out equally delicious. So long story shot, the book is in my Amazon shopping cart (just wanting to qualify for free shipping)! Four crates, three pieces of wood, a handful of nails, a tube of liquid nails and vintage wheel casters: the ingredients I used for my first attempt at carpentry. I will tell you this, it was not easy, and I was quickly frustrated by the frequency of my mistakes. But the end product is something I will always treasure. 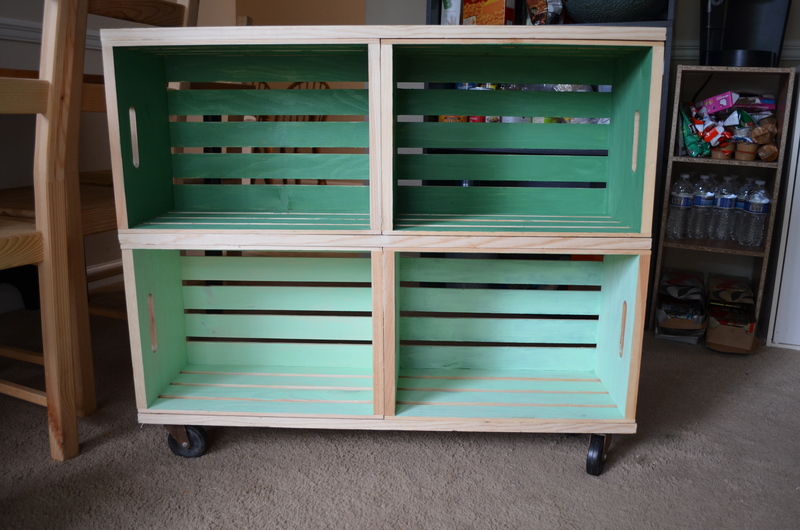 This is how I built a bookshelf out of wooden crates (along with the lessons I learned from doing it wrong). Lesson #1: It is stupid to paint the wood before you start building. Just stupid. 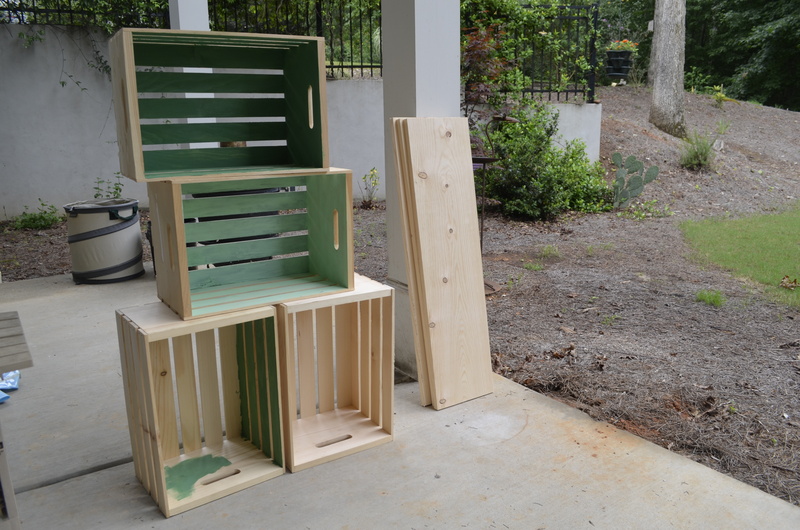 Before I even bought nails, I painted two of the wooden crates, which proved futile. I ended up having to sand and paint them again once the bookshelves were assembled. 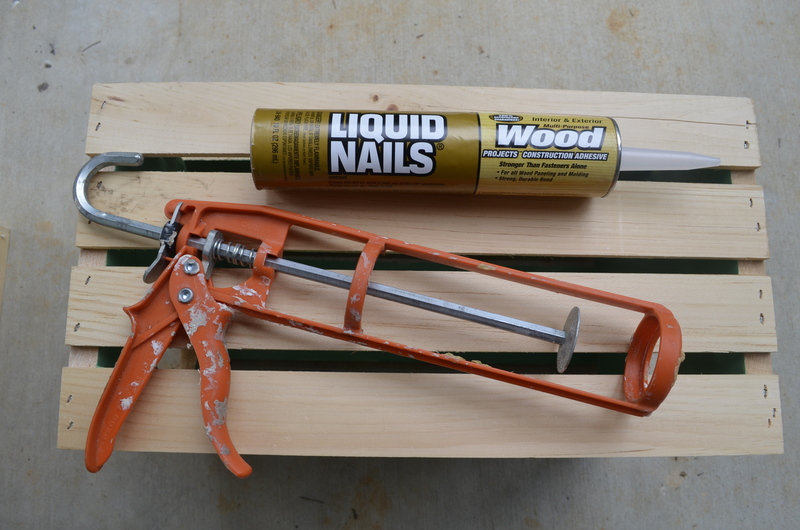 Lesson #2: Liquid Nails are great, but make sure you have several wood clamps if you decide to use it. 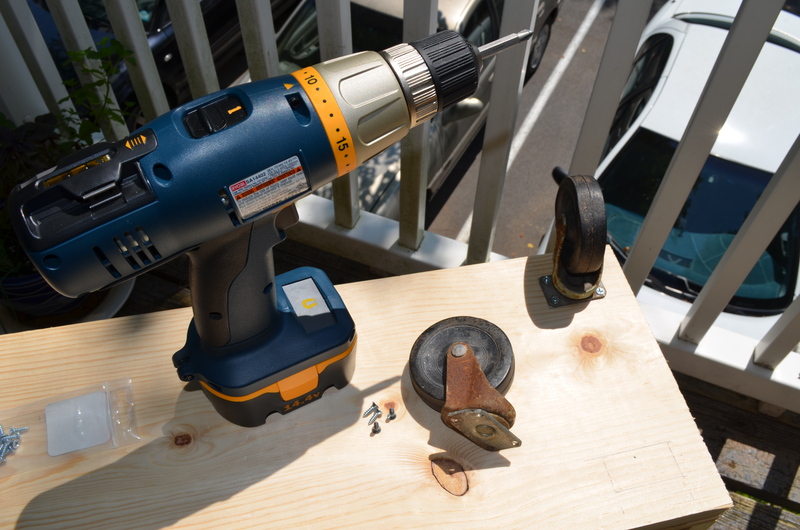 Being new to the world of power tools, I saw Liquid Nails as an easier option – compared to learning how to use the power drill my father gave me. And yes, Liquid Nails are super easy. 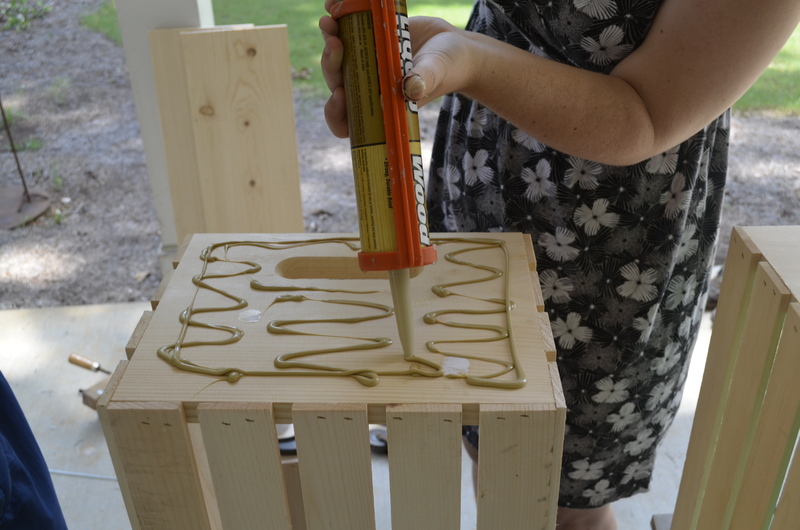 Using a caulking gun, I evenly distributed the glue, leaving an inch margin around the edge. 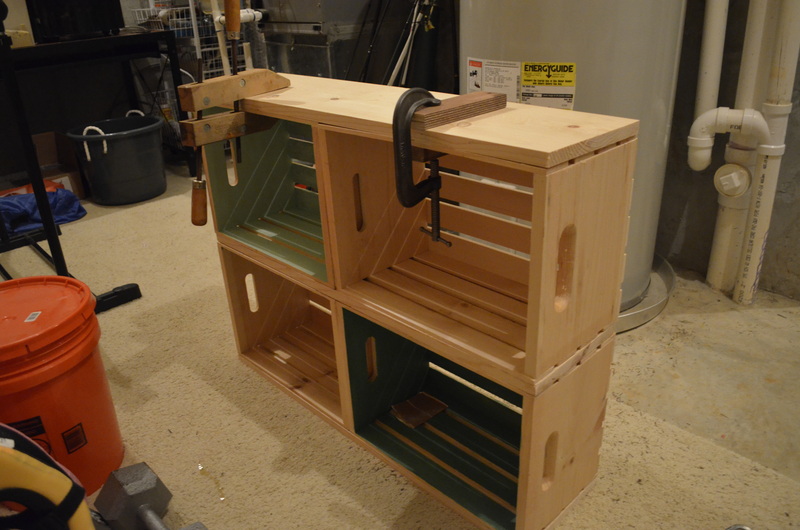 I had two clamps (see the picture below). 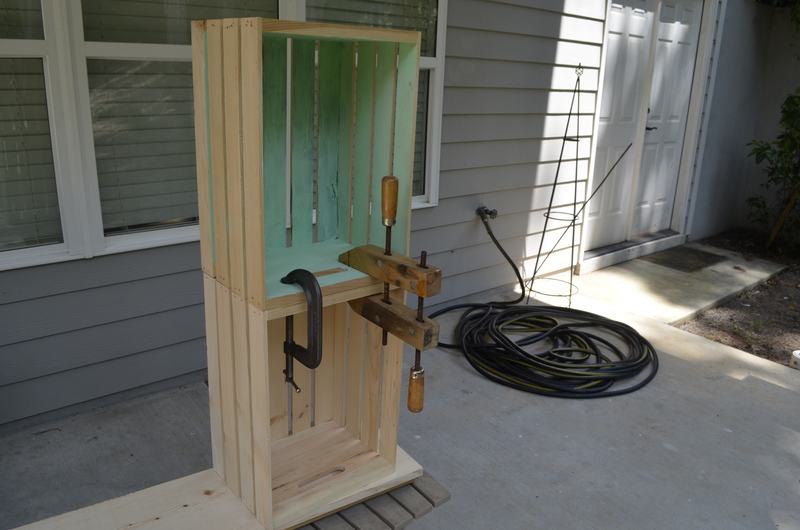 The wooden clamp on the right worked great, distributing pressure relatively evenly. The problem is, I needed like four more. The metal clamp did not apply pressure evenly. It really wasn’t that helpful. The other issue I faced was separation on the back side of the crate. Lesson #3: Wood sizes are not the same as the advertised measurements. To make the bookshelves more sturdy, I decided to use three planks of wood – one below, between and on top of the crates. To do this, I purchased one 10-foot long 1×10 wood board. 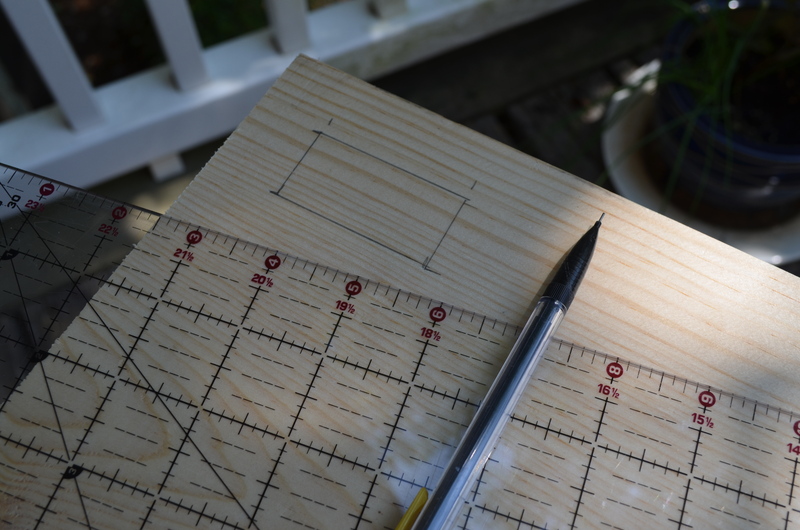 When I went to the cutting station at Home Depot, I had him cut the board into three 3-foot long pieces. And because the width of the crates is 9 inches, I needed him to cut one inch off of the width of the boards. Sadly, the Home Depot employee said he cannot do such a shallow cut. I look him in the eyes. Obviously, I did not know that. Sure enough, we measure the wood, and it is exactly 9 inches in width. The wood turned out to be perfect. Lesson #4: Don’t be lazy. Use painter’s tape. 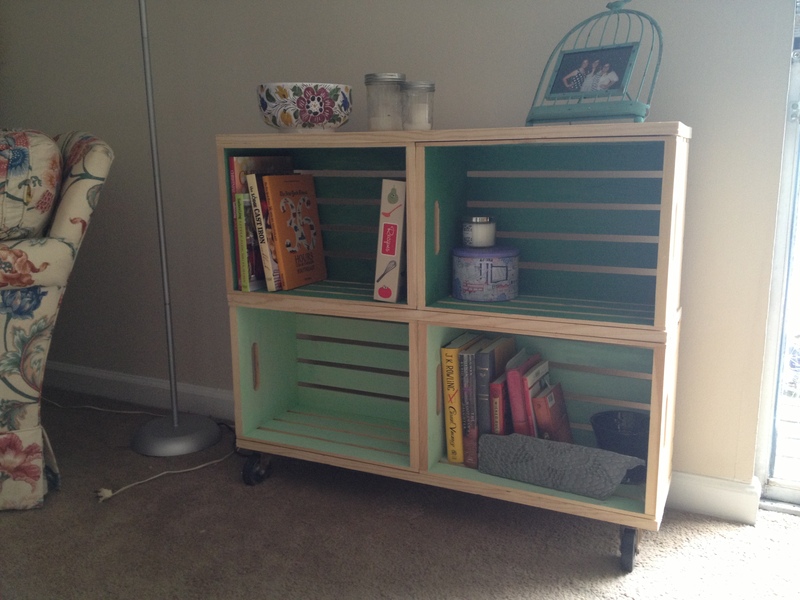 I love the look of natural wood, but I wanted these bookshelves to have a pop of color. So my goal was to paint only the interiors, leaving the edges and outsides raw wood. I started out being a little overly confident, thinking I could paint within the lines. But quickly, I made a few mistakes here and there. 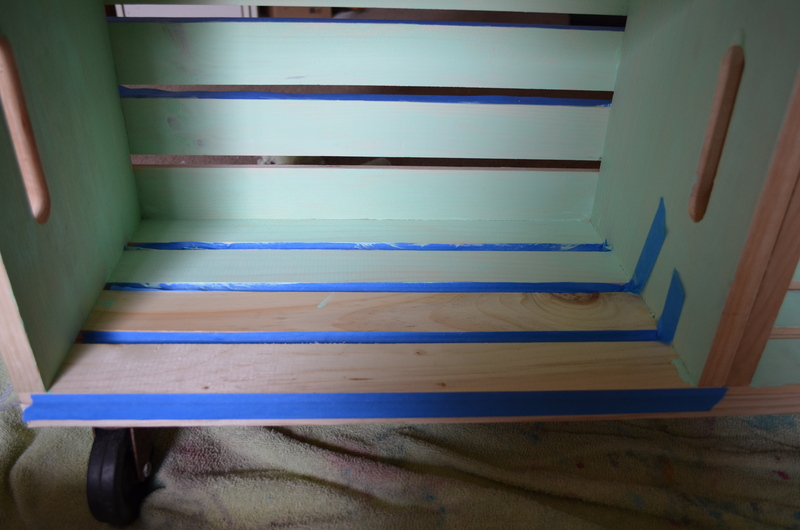 Luckily, sanding the wood once it drys can remove the paint, but I learned that painter’s tape is the easiest, time-saving solution. Lesson #5: Craft paint is not ideal for this type of project. 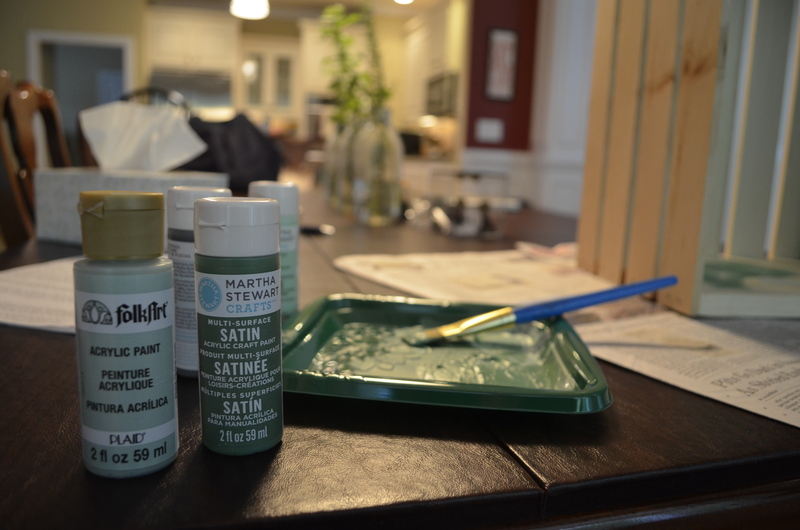 Though the small bottles of paint were nice to test paint colors, they definitely did not provide enough paint for the entire project. I had to go back to the store to buy several more bottles, proving to be less cost-efficent than if I bought a small can of paint from Home Depot. I decided to use two different color to create an ombré effect (because Pinterest tells me it’s so trendy). I was hesitate about it at first, but the two colors I chose ended up being a perfect combination. Lesson #6: It’s important to buy the right size screws. Though I did not make this mistake, I recognized that this is an important thing to consider. In my case, I did not need the screw to connect with the second piece of wood. I just needed to attach the wheel casters. With a 1 inch-thick piece of wood, I used 3/4 inch-long screws. I found my wheel casters at construction warehouse sale – 4 wheels for $5. They were rusty and had flattened sides. (I liked how it provided some character.) But you can purchase brand new wheels at Home Depot for around $5 each. Securing the wheels in place, I made sure to measure off their placements first. (No one wants an uneven bookshelf.) I used a 1 inch margin from the edge. Somedays, you have to let yourself improv with your creativity. I found this yellow chevron-print fabric in the scrap section of the fabric store, and I decided it needed to be a background for something. Yellow is not my go-to color, but occasionally, I try to bring some bright colors into my life. To compliment it, I went to the default: felt. I knew I wanted to use the phrase, but the idea for the flowers just came to me. I played around with cutting out different sizes and using different colors, but I think I was smart to keep it simple and use two different flowers. 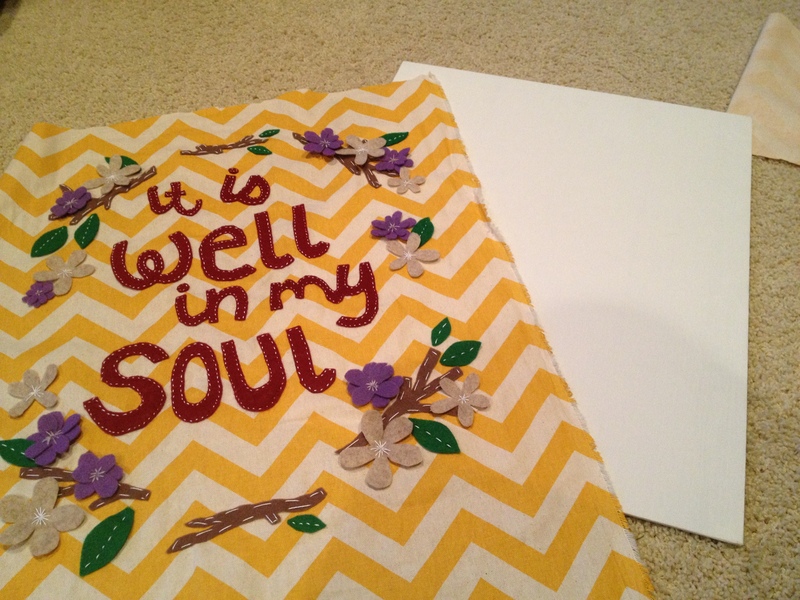 Once the felt was sewn on, I mounted the fabric to a flat canvas. Using clear packaging tape, I wrapped the fabric around the board and taped it down on the back. 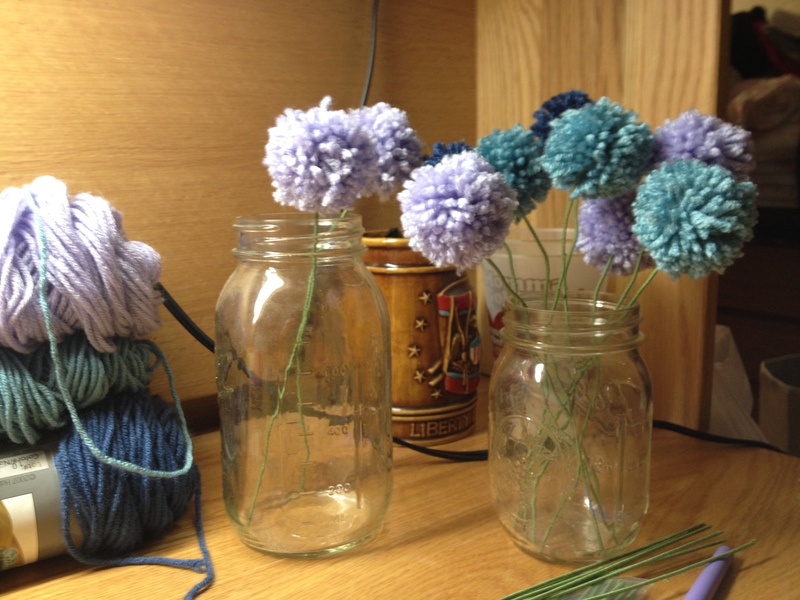 When it came time to start thinking about things to make for Samford’s Spring Fling Flea Market, these pom-pom yarn flowers were the first thing I thought of. One, they are incredibly easy to make. Two, the materials are super cute. And three, the are simply adorable. I only sold them for 50 cents, and since so many people asked me how to make them, I decided to provide a little tutorial. 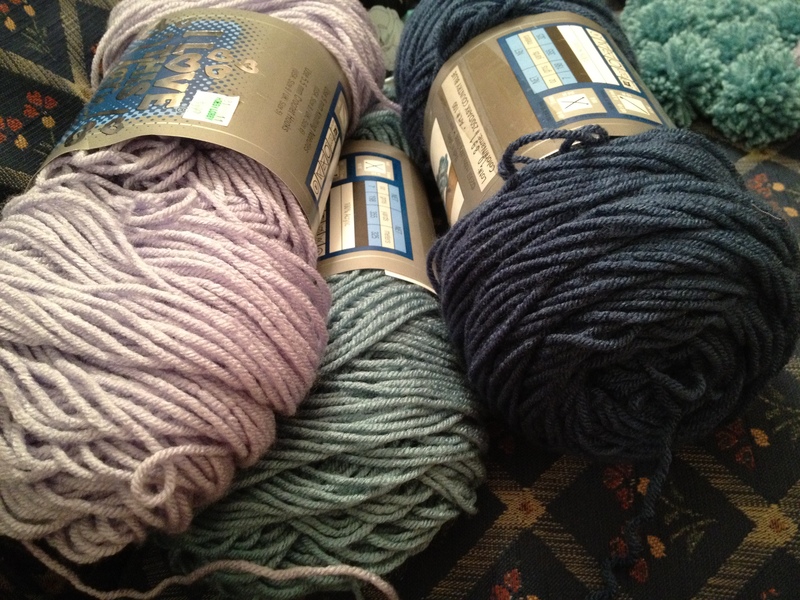 Step one – pick out the yarn. 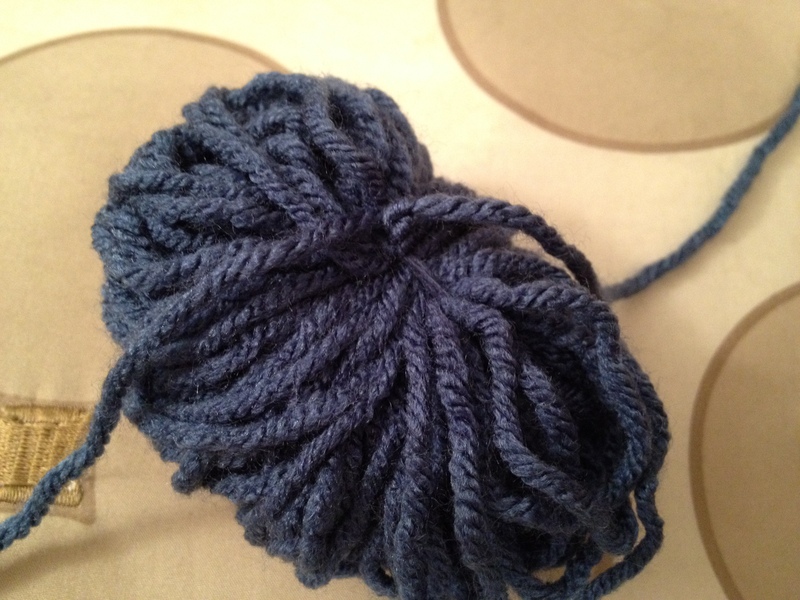 For this project, you are going to waste a good amount of it, so make sure to pick the cheapest yarn available. Pick any color. To my surprise, the navy flowers sold out faster than the others. I figured the light purple would go first, but I was proven wrong. 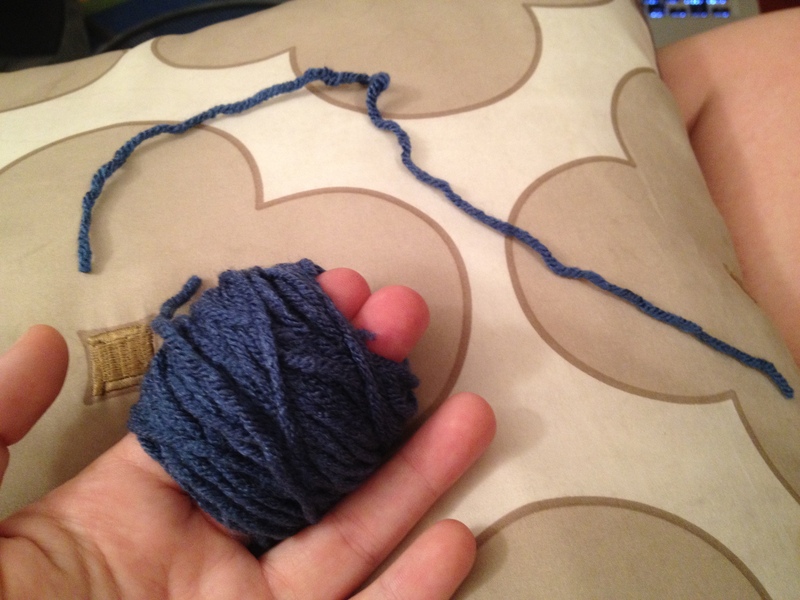 Step two: Take the yarn and start wrapping it around two of your figures. You’ll need to do this maybe 120 times. 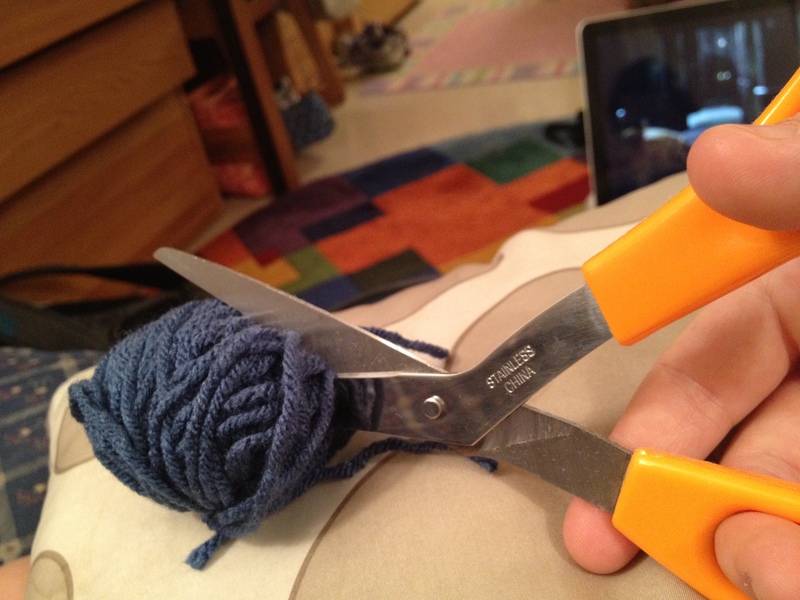 Then cut a spare piece of yarn. 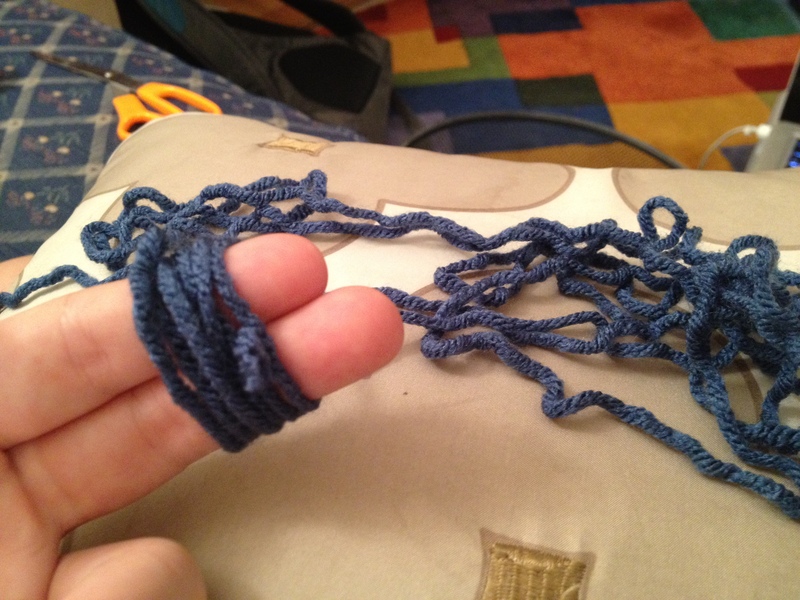 Step three: String the yarn through the ball and tie a knot (double knot it, just in case). Make sure the knot is tight. If not, all the yarn will fall out. 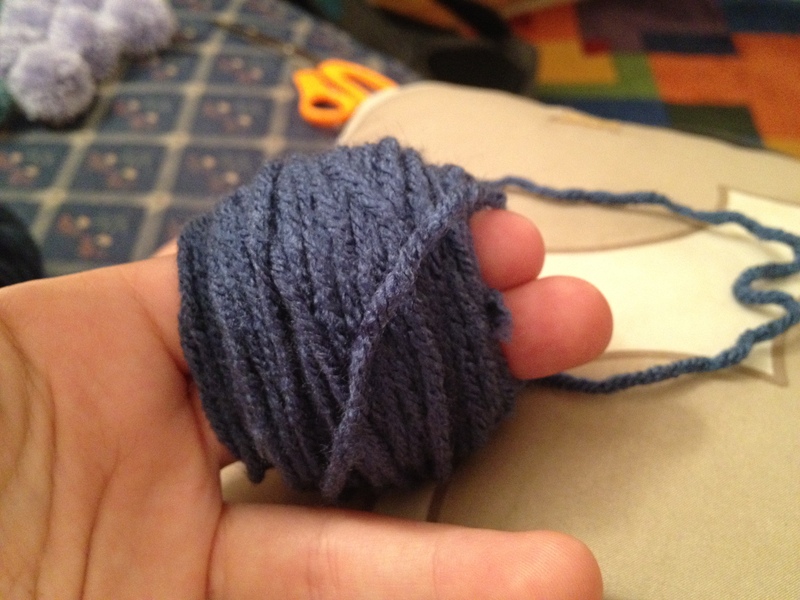 Step four: Cut through the yarn on the opposite side of the knot. 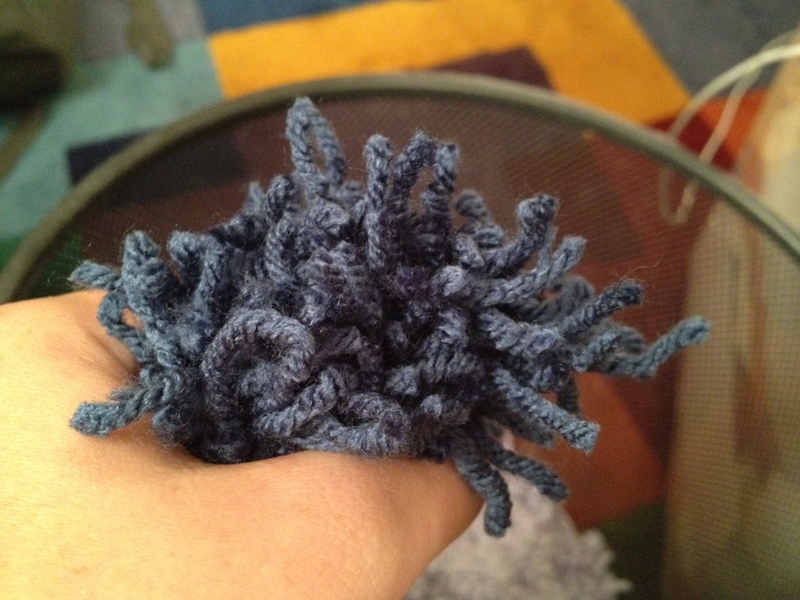 This will result in a crazy-looking pom pom. 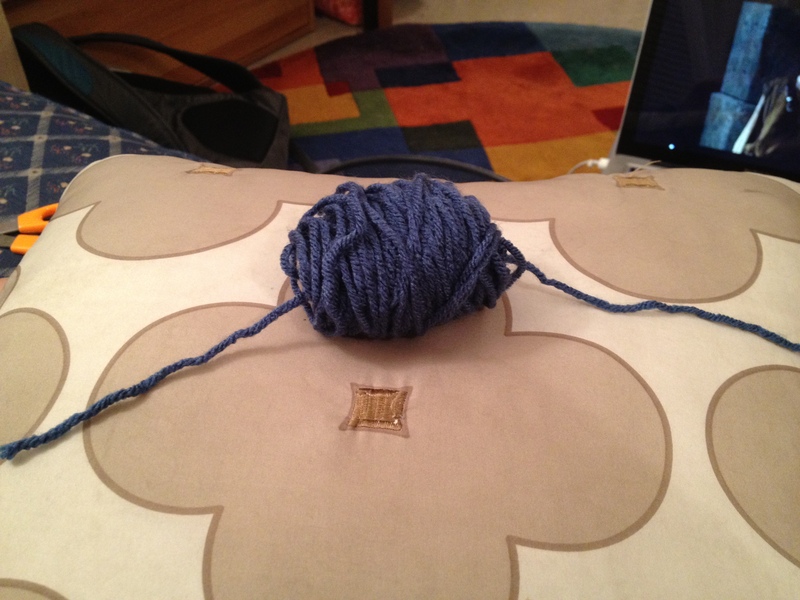 You’ll have to cut a lot of yarn off before it starts to resemble the finished product. Finished, it should look like this. 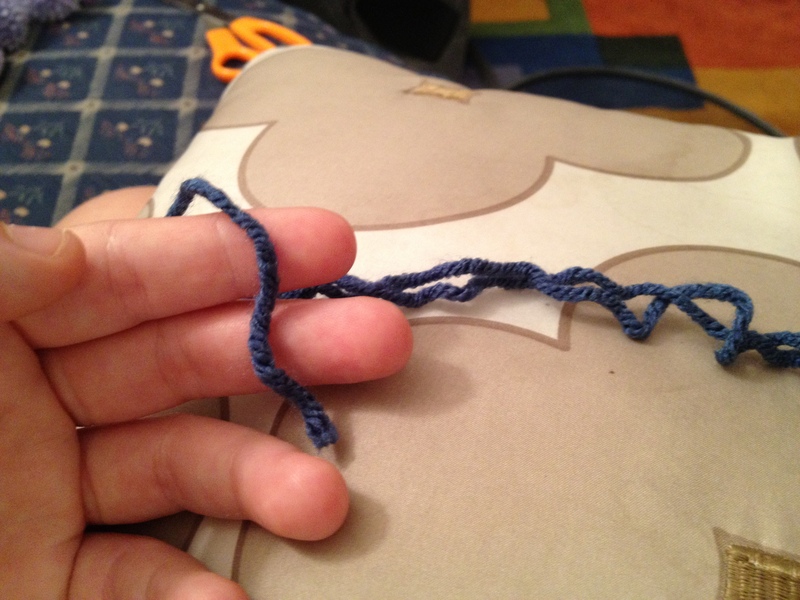 Once you have mastered this, you really can make so many things. 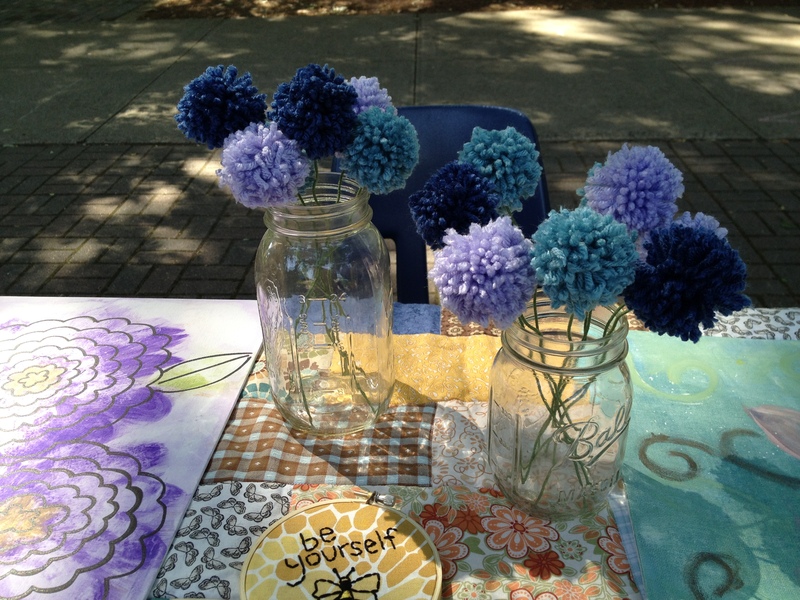 I have seen them placed on wreaths, made into garlands or like mine, turned into my version of a crafty dandelion. 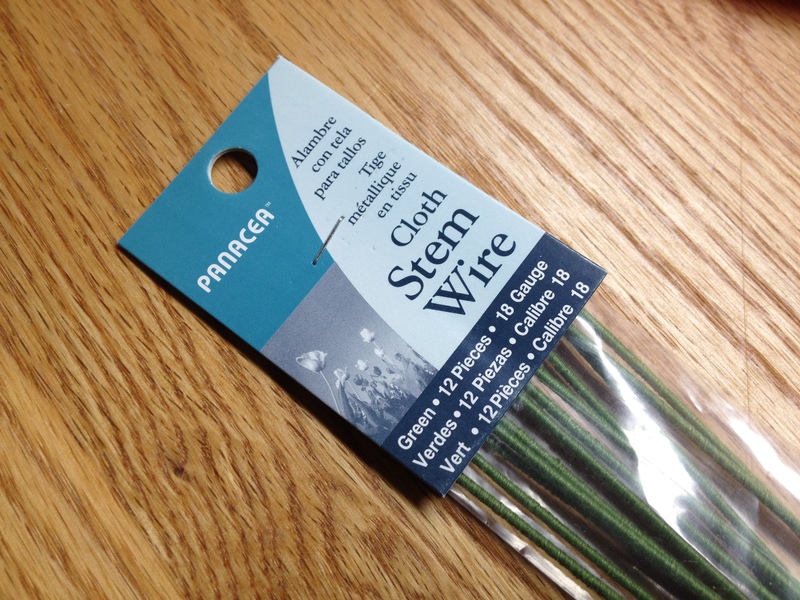 To make the little flowers, I purchased some cloth stem wire. 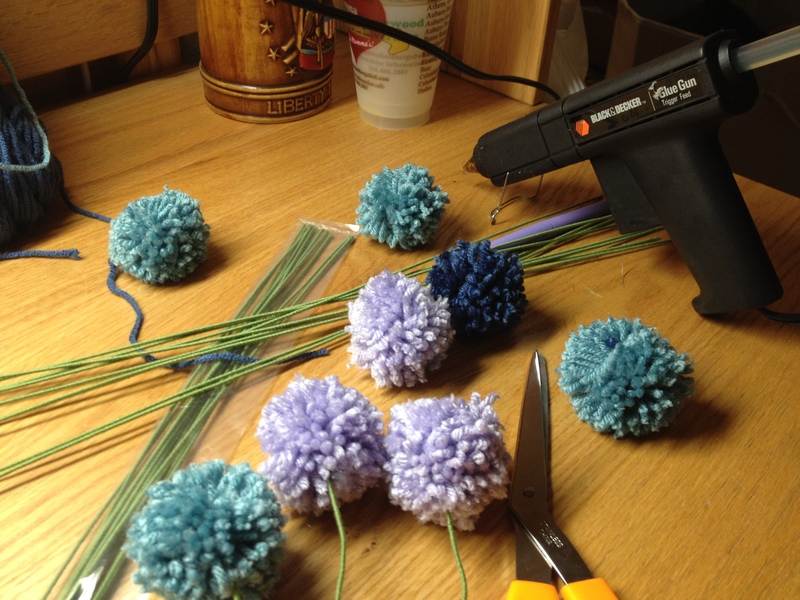 Last step: I cut the wire in half, placed one end in the pom pom and used a glue gun to make sure it will stay in place. I love how sweet they turn out. And once you get them down, you can make 3 in 5 minutes. Super easy and super fast. I uploaded pictures from my camera today and found this little gem from the last month. 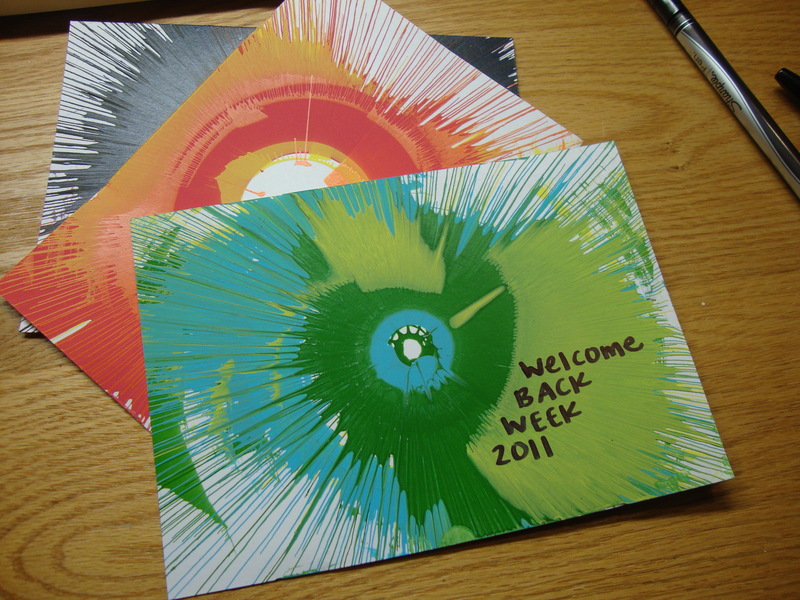 For Welcome Back Week, we had an “art” day, meaning free Pastry Art’s baby bites, free caricature artists and my favorite, free spin art! We put a clothes line out between two trees for people to hang their spin art to dry, but secretly, I do this so I can collect all the abandoned and the forgotten ones for myself. Truth be told, spin art makes the best stationary. 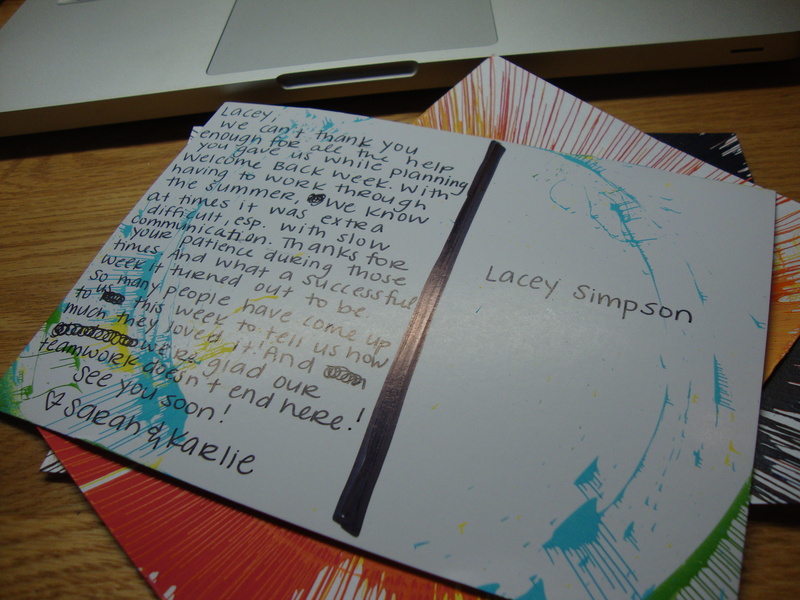 Here, I used it to write thank you letters to people who helped us out during the week. I use them as post cards, simply drawing a line down the middle. I think the extra paint on the back makes it look even better. If only I could have my very own spin art machine, I could start a business.